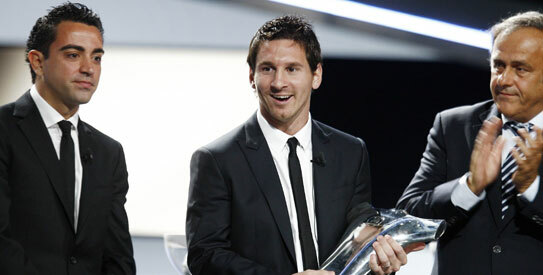 Lionel Messi of Argentina has won the inaugural UEFA best player in Europe Award held on Thursday in Monaco. He led the voting ahead of Xavi , his Barceolna team mate , and Real Madrid's Christiano Ronaldo. A panel of 53 sports journalists from across Europe unanimously chose Messi as the winner. Messi won 38 votes, finishing ahead of Xavi who won 11 votes to Ronaldo’s 3. 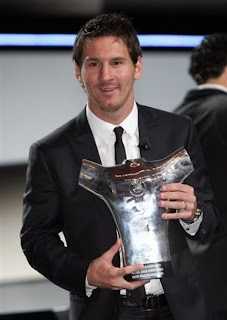 UEFA President Michel Platini presented the inaugural award to Messi at the Grimaldi Forum in Monaco, where the UEFA Champions League draw was also held. FC Barcelona had two more players in the top ten: Andres Iniesta who finished fourth and Gerard Pique who was eighth. The Argentine international hit 53 goals last season, including 12 in the Champions League where he finished top scorer for the third successive season. Messi’s last European goal of the season was the second in Barcelona’s 3-1 final win over Manchester United in May and he also helped his club to a third straight La Liga title. Barcelona meet Europa League winners Porto in the European Super Cup here on Friday.